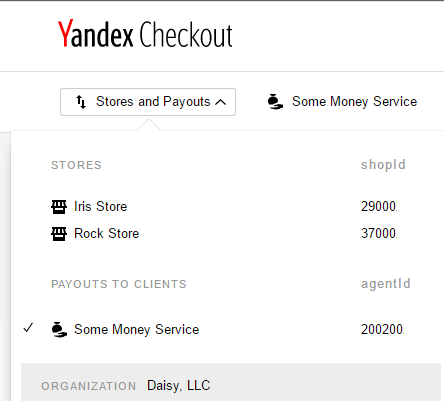 Yandex.Checkout allows managing several stores. This is a useful feature for companies with several trading platforms on different sites. The first store is implemented via your Merchant Profile. All the rest can be implemented by request to our manager. You can also use several services (or payout gateways) for making payouts to your clients. Write to your manager you want to onboard one more store. Specify your new site's URL, TIN of the company or number of your contract with Yandex.Checkout, and your CMS name (if present). If you want to onboard a site using HTTP Protocol scheme, attach a to your message. The manager will guide you through further steps. You can activate a new payment gateway via our manager. Log into your Merchant Profile. Find Stores button in the left-hand corner. It opens full list of your stores that are onboarded to Yandex.Checkout, were onboarded before, or being onboarded at that moment. If you only use payouts, you will see Payouts button. If you use both, you will see Stores and Payouts button. Name—your customers will see it in the payment form and receipt. shopId—store's identifier; used for performing payments. Status—an image on the right. If the image is not there, the store accepts payments. agentId—store's identifier; used for performing payments. Balance—amount of your limit for payouts. Status—an image on the right. If the image is not there, the payouts are active. You can credit money to your clients. When switching between stores and payouts, details under the sections Operations, Settings, Contract, and Acts change. Contents of other sections remain unchanged. Status shows whether you can accept money at the moment and what is going on with the store right now. Store is offline The store is being onboarded. When done, you can start accepting payments. Store is operating Everything is all right: the store is on and can accept payments. Store is closed The store was onboarded with Yandex.Checkout, but can accept payments no longer. You can view its History and Settings. Store is not operating. The store cannot accept payments. It is temporary. You can view its History and Settings. If something is wrong with the status, contact your manager. Status shows whether you can credit money and what is going on with payouts right now. Payouts are not activated Payouts do not work: not activated yet or already disabled. Contact your manager to enable them. Payouts are on You can credit money to your clients. 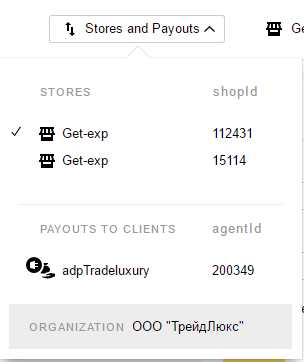 You can use different methods for implementing new stores to Yandex.Checkout. The selected implementation method determines how you will get notices about successful payments and how you need to process notices from the payment service. You can change the implementation method via your manager (please note all store settings will change along with the implementation method).